For most movie fans, knowledge of the USS Indianapolis comes from Quint’s memorable speech in 1975’s Jaws. With 2016’s USS Indianapolis: Men of Courage, we get a film that delves deeper into the subject matter. 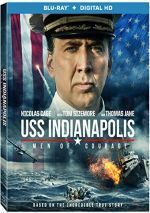 Set in 1945, the USS Indianapolis delivers segments of the atomic weapons that will eventually be dropped on Japan. Led by Captain Charles McVay (Nicolas Cage), the ship then patrols the Philippine Sea when torpedoes sink it. This leads to a desperate attempt at survival. Those not killed during the attack deal with shark-infested waters as they await hoped-for rescue. In 2016, Nicolas Cage acted in five movies. According to IMDB, he’ll work in another five 2017 releases. That’s a pretty relentless schedule, one that implies Cage takes roles for the money more than artistic value. Which remains a shame, as Cage used to be a truly fine actor. At some point he appears to have decided that paychecks meant more to him than quality, and his acting frequently lives down to the often poor quality of these projects. As far as my expectations for Cage’s films has fallen, I went into Courage with hopes that it’d succeed. I’ve always enjoyed World War II history, and as hinted at by the aforementioned Jaws scene, the basic tale of the Indianapolis offers great dramatic potential. Alas, Courage does its best to squander all of its possibilities, as it delivers a tedious, cliché affair. Essentially a messy melange of WWII movie staples, the movie exhibits little drama during its forgettable version of events. Most of the problems revolve around the stiff, stilted script. This sticks the actors with awkward, unnatural dialogue and gives us uniformly trite characters. If you’ve ever seen a parody of a WWII movie, you’ll know what to expect from the personalities of Courage. Cliché to the bone, not a single one stands out as memorable or distinctive, so they all blend together. This actively hampers the movie’s dramatic impact, as we find it tough to remember who’s who. If we can’t even identify most of the characters, we can’t care about them. And we don’t – not beyond a generic sense of sympathy, at least. Given the lack of clarity or differentiation among the roles, it becomes next to impossible to develop concern for them. The script also attempts to cram way too much material into its 131 minutes. We get to know the characters before deployment as well as the mission itself, the Japanese assault, the time spent in pursuit of rescue and these events’ aftermath. Any one of those segments could’ve formed a movie unto itself – or have been part of a mini-series. The decision to spread the story so thin makes matters even more superficial than otherwise might be the case, so once again, Courage becomes a flat, forgettable affair. Director Mario Van Peebles does his best to muddy the waters via his clumsy storytelling. He packs the film with unnecessarily frantic camerawork and can’t figure out how to meld all the events/characters into a seamless whole. This makes the already spotty screenplay even more of a mess. At least some of the action scenes manage some drama. Even if the ship’s destruction feels an awful lot like outtakes from Titanic, the film presents these segments with reasonably vivid execution. Unfortunately, those moments fail to make the overall product worthwhile. The root story of Courage boasts plenty of natural drama, but the film can’t take advantage of those positives. USS Indianapolis: Men of Courage appears in an aspect ratio of approximately 2.40:1 on this Blu-ray Disc. This turned into a pleasing presentation. Sharpness tended to seem fine. Some interiors could appear a bit soft, but not to a significant degree. This meant the film usually looked accurate and well-defined. I saw no jaggies or shimmering, and edge haloes remained absent. Print flaws also failed to create distractions during this clean presentation. In terms of colors, Courage opted for stylized hues, as it favored a standard – though semi-subdued – orange and teal. None of these hues stood out, but the Blu-ray reproduced them as intended. Blacks were deep and firm, and shadows offered appropriate clarity, with nice development of low-light shots. The image held up well and provided a good reproduction of the source. Even more satisfying, the film’s DTS-HD MA 5.1 soundtrack added a lot to the experience. Quieter scenes – like those onboard ships/subs – added a nice sense of place/ambience, and music boasted fine stereo presence. As expected, the movie’s big action scenes fared best. Those created a terrific sense of the action, as planes and other war-related elements occupied all five channels. These blended together in a smooth, vivid manner to create a truly dynamic feel for the material. Audio quality also was solid. Speech seemed crisp and distinctive, as I noticed no flaws like edginess. Music seemed warm and full, while effects added a real bang to the proceedings. Those elements showed good clarity and accuracy, and they offered tight, deep bass as well. The track seemed vibrant and dynamic as it accentuated the movie in a satisfying manner. In terms of extras, only one component arrives. The Making of USS Indianapolis: Men of Courage runs 33 minutes, 11 seconds and presents comments from director Mario Van Peebles, writer/producer Ricgard Rionda Del Castro, writer Cam Cannon, producer Michaal Mendelsohn, executive producers Patricia Eberle and Timothy Patrick Cavanaugh, Saban Films’ Bill Bromiley, Edge Innovations’ Walt Conti, Navy SEAL John Rottger, Silo’s Don McCoy and Sean Hart, line producer Bill Wilson, production designer Joe Lemmon, sound mixer David Parker, Mobile Film Commission’s Eva Golson, costume designer Patrick O’Driscoll, script supervisor Melissa Randall, composer Laurent Eyquem, survivor Grandville Crane, daughter of survivor Maria Bullard, and actors Nicolas Cage, Thomas Jane, Tom Sizemore, Cody Walker, Adam Scott Miller, Johnny Wactor, Mandela Van Peebles, Jose Julian, Matt Lanter, Joey Capone, Callard Harris, Yutaka Takeuchi, Craig Tate, Emily Tennant, Brian Presley and Weronika Rosati. “Making” examines the source events and research, story/character areas, cast and performances, shooting ocean scenes, recreating sharks and other effects, sound recording/design, sets and locations, costumes and period details, and music. In a relatively short period of time, “Making” throws out a lot of participants and touches on a wide variety of domains. It does so in a reasonable manner, though it bites off more than it can chew. This leaves it as a moderately informative but rushed program. The disc opens with ads for Harley and the Davidsons, Hacksaw Ridge, Standoff, The Trust and Deepwater Horizon. No trailer for Courage shows up here. At its core, USS Indianapolis: Men of Courage promotes a stirring, memorable piece of history. Unfortunately, it treats this material in the most cliché, superficial manner possible. 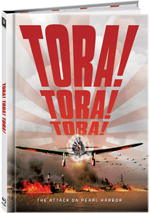 The Blu-ray offers very good picture and audio along with a decent behind the scenes program. Chalk up Courage as a one-dimensional disappointment.